Conservative candidate Gjorge Ivanov leads his rivals after Sunday’s presidential election in Macedonia, the State Election Commission said Monday. But the vote appeared to be heading for a runoff on April 5 with no candidate on course to secure an overall majority. The election is seen as crucial to the former Yugoslav republic’s prospects of joining NATO and the European Union after parliamentary elections last June were marred by violent clashes, prompting criticism from election observers. 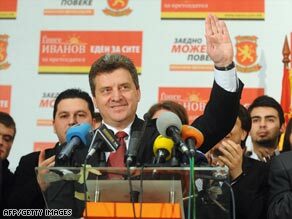 Ivanov, of the ruling VMRO-DPMNE party, had 35 percent of the vote with 94 percent of ballots counted, the election commission said. Ljubomir Danailov of the Social Democratic Union of Macedonia is currently in second place with just over 20 percent of the vote. Turnout in the presidential and local elections was about 55 percent, the commission reported. EU envoy to Macedonia Erwan Fouere said the vote had been carried out in a “calm atmosphere,” Reuters.com reported. Officials from the International Election Observation Mission, which deployed around 300 observers across the country, is due to issue its preliminary report into the conduct of the ballot later Monday. The Balkan country has been at loggerheads over its name for 17 years with Greece, which blocked its entry to NATO last year over the dispute. Greece claims that the name “Macedonia” implies territorial ambitions on the Greek province of the same name. Macedonia denies it. The two countries have taken their dispute to the International Court of Justice.